The 2010 Dietary Guidelines for Americans focuses on balancing calories with physical activity, and encouraging Americans to consume more healthy foods such as vegetables, fruits, whole grains, fat-free and low-fat dairy products, and seafood, and to consume less sodium, saturated and trans fats, added sugars, and refined grains. With so many food options available to consumers, it is often difficult to determine the best foods to put on our plates when building a healthy meal. MyPlate is an uncomplicated symbol to help remind people to think about their food choices in order to lead healthier lifestyles. This effort is about more than just giving information, it is a matter of making people understand there are options and practical ways to apply them to their daily lives. 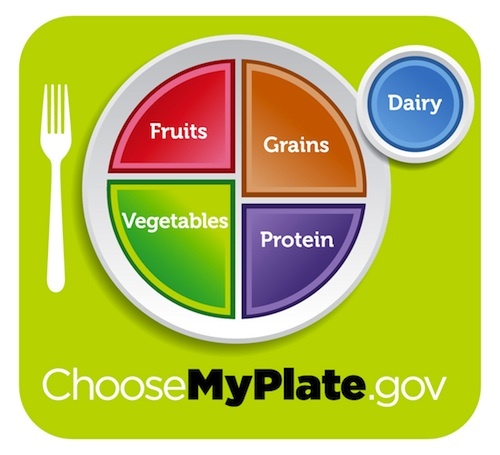 The MyPlate icon emphasizes the fruit, vegetable, grains, protein and dairy food groups; the pie-shaped sections are larger for vegetables and grains, and smaller for fruits and proteins. To help consumers build healthier diets, the campaign website ChooseMyPlate.gov provides resources and tools for dietary assessment, nutrition education, and other user-friendly nutrition information. Obesity increases a person’s chance of developing a number of health problems, including type 2 diabetes, heart disease, high blood pressure, and some cancers. To combat the U.S. obesity epidemic, the ChooseMyPlate.gov resources and tools empower people to make healthier food choices for themselves, their families and their children. This is a quick, simple reminder for all of us to be more mindful of the foods that we’re eating and as a mom, I can already tell how much this is going to help parents across the country. When mom or dad comes home from a long day of work, we’re already asked to be a chef, a referee, a cleaning crew. So it’s tough to be a nutritionist, too. But we do have time to take a look at our kids’ plates. As long as they’re half full of fruits and vegetables, and paired with lean proteins, whole grains and low-fat dairy, we’re golden. That’s how easy it is. Since 1992, American consumers have been following the food guide pyramid. The pyramid was divided into six sections: basic foods were at the base and included bread, cereal, rice and pasta. Two middle sections consisted of vegetables and fruit; two top sections consisted of milk, yogurt and cheese, and meat, poultry, fish, dry beans, eggs and nuts. In an effort to simplify the design and promote physical activity, the food pyramid was updated in 2005 to MyPyramid. However, many people found it complicated (MyPyramid has 12 sets of possible recommendations) and confusing (food group pictures were replaced by colored vertical bands that represent different food groups). Later this year, the USDA will unveil an exciting “go-to” online tool that consumers can use to personalize and manage their dietary and physical activity choices. Over the next several years, USDA will work with First Lady Michelle Obama’s Let’sMove! initiative and public and private partners to promote MyPlate and ChooseMyPlate.gov as well as the supporting nutrition messages and “how-to” resources. First Lady, Agriculture Secretary Launch MyPlate Icon as a New Reminder to Help Consumers to Make Healthier Food Choices. United States Department of Agriculture Center for Nutrition Policy and Promotion. 2011 June 2.